4 Bedroom Detached House For Sale in Orpington for Asking Price £740,000. 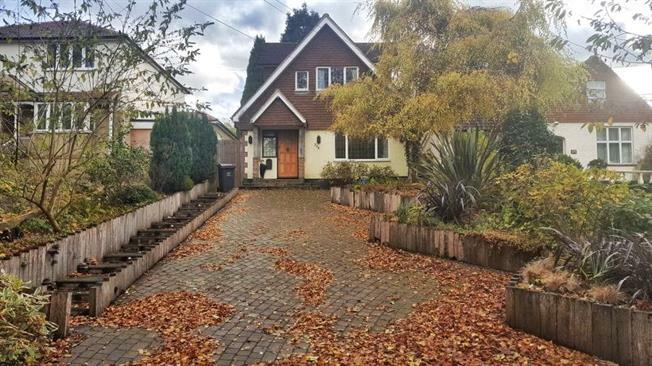 This chalet style detached house offers the growing family well-proportioned accommodation over two floors, including four bedrooms on the first floor. Downstairs, you will find three reception rooms off of a bright and spacious hallway plus a modern fitted kitchen/breakfast room overlooking the rear garden. You will also find a downstairs shower room with WC along with the first floor bathroom, plus a separate utility room. A block paved driveway at the front provides room for off-street parking and there is a secluded private garden with large summerhouse to the rear. Those with young children will be pleased to hear that the property lies within the 'Outstanding' rated Warren Road Primary School catchment (0.1 miles away) and commuters benefit from being within 0.75 miles of Chelsfield station (fast direct service to London in c.21 minutes). Local shops are also within half a mile both at Crescent Way and Windsor Drive. Orpington is a thriving suburban town within the M25 and therefore ideally situated for access to the motorway network and the railway stations that can transport you into London in as little as 17 minutes. The Town Centre has a comprehensive range of shops and facilities including the Walnuts Centre and Odeon cinema. Sports facilities are also well catered for with the Walnuts Leisure Centre, golf courses, football and rugby clubs all within the area. A little way out of town you will find larger shops at the Nugent Retail Park as well as the large DIY stores. Shopping centres at Bluewater and Bromley can also be found within 10 miles drive or bus ride. The Orpington district has lots of green areas to enjoy including Priory Gardens and Goddington Park and the rolling Kent countryside starts from the edge of town where you will find cosy country pubs in the surrounding villages. Many people are drawn to the area for the reputable schools that include Warren Road Primary. St Olaves Grammar School for Boys and Newstead Wood Grammar School for Girls are also within the BR6 area, 0.7 miles and 0.85 miles away respectively.